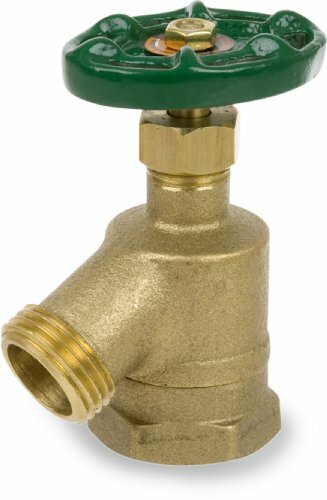 This Smith-Cooper International 170L series brass garden valve has lead-free construction for use with potable water, a handwheel, and a female National Pipe Taper (NPT) thread inlet connection, and is used to control flow (throttling) to a hose. The corrosion resistant valve body and seat are constructed of ASTM International B-584 C89550 brass alloy, which contains 0.1 percent lead for a "lead free" designation. Its inlet connection is female NPT for connecting to a male threaded fitting, its outlet connection is male hose thread, and its elbow shape helps liquid drain away from the valve. A manually operated cast iron handwheel rotates the inside screw mechanism, which lifts and lowers the Nitrile seat disk to regulate the flow between the connected pipe and hose. The valve body has packing in the stuffing box to reduce the risk of leakage around the valve stem. The valve’s maximum pressure is 125 pounds per square inch (gauge) (psig) for water, oil, and gas (WOG). This garden valve is CSA International approved and meets NSF International/American National Standards Institute (NSF/ANSI) 61.8 standards and complies with California Assembly Bill 1953 (AB1953), which limit the amount of lead in plumbing fixtures that come in contact with water intended for human consumption. This rising stem garden valve is a type of globe valve and is suitable for use in various water plumbing systems. Smith-Cooper International distributes pipe, fittings, and valves under its SCI trademark and manufactures valves under the Sharpe brand. The company, founded in 1993 and headquartered in Commerce, CA, meets International Organization for Standardization (ISO) standard 9002.